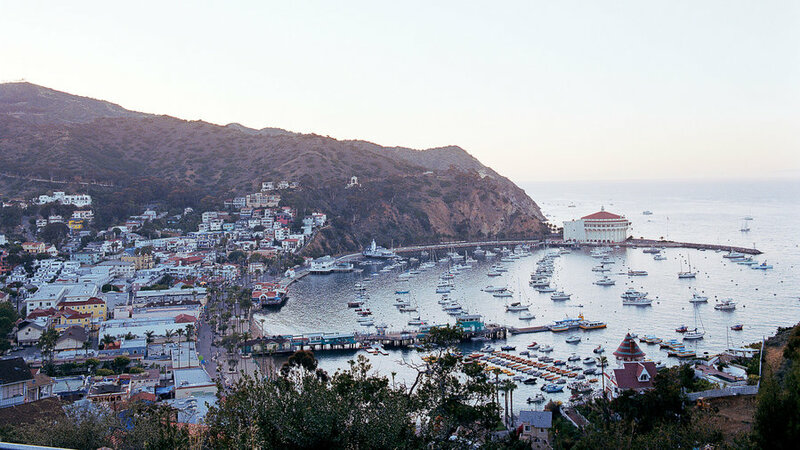 It wasn't that long ago when a visit to Catalina meant rising at the crack of dawn to board one of the few daily boats, then braving a three-hour ride across often rough seas. 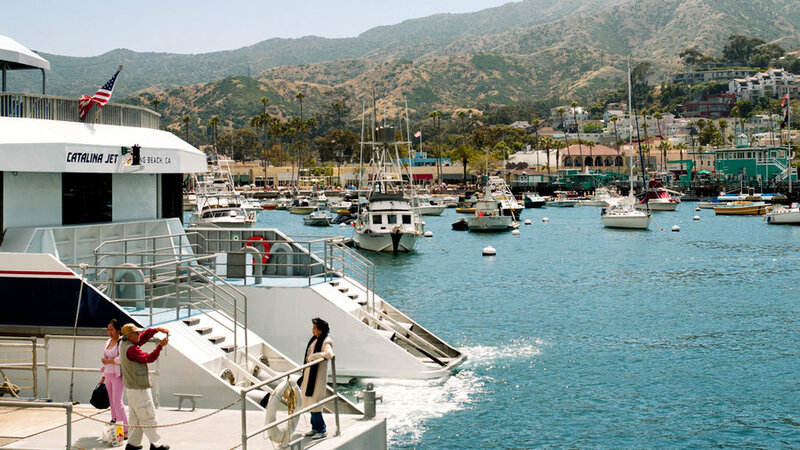 But over the past decade, Catalina Express added faster ferries to its fleet and became one of the first operators in the country to equip all its boats with ride control, which eases the journey. Now, even those prone to seasickness can enjoy the romance of the ride—about one hour long—while strolling along the top deck. $73 round-trip from San Pedro, Long Beach, or Dana Point; . Avalon, Catalina's main town—all one square mile of it—is the only city in California that regulates the number and size of vehicles allowed to drive its skinny streets. The current waiting list to own a car on the island? 14 years. So instead of SUV-plugged traffic jams, expect to see golf carts whizzing by on the streets. Avalon's Pavilion Hotel has everything you'd want in an island home base: ocean views, appropriate thread counts, private patios, complimentary wine and cheese. But it also does everything it can to keep you out enjoying the island. Think heli-biking and heli-hiking packages. Think spa treatments using local seaweed. Think 14 short steps to the beach. From $375-$950; . Adventurous types have always favored Catalina's wide-open interior—great for camping, hiking, and spotting bison, foxes, and birds of prey. But these days, the wilds within the city limits are giving active travelers plenty of reasons to stay put in Avalon. The 1.1-mile Garden-to-Sky Hike starts at Wrigley Memorial & Botanic Garden and climbs 1,100 feet to breathtaking vistas of the island. Back at sea level, you can spot dolphins and sea lions in Avalon Bay from the piers along the crescent-shaped harbor. Up above, Catalina Zip Line Eco Tour takes flight from 500-foot-high platforms with views of the canyons and the Pacific. Hike: Free permit from Wrigley Memorial; . Zip Line: Tour $120; 1 Descanso Canyon Rd. ; (310) 510-8687. For movie stars in the 1930s, the elegant Hotel St. Catherine was the place for a romantic rendezvous. Charlie Chaplin, Clark Gable, and Joan Crawford were frequent guests. 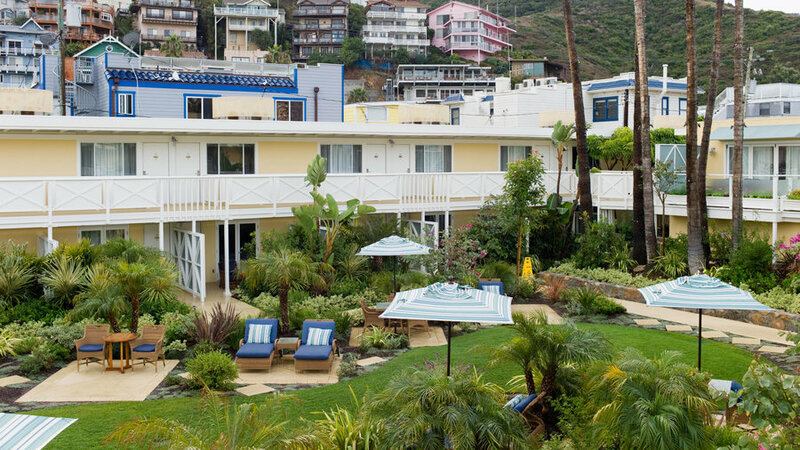 The hotel was demolished in 1966, but its spirit lives on at the Descanso Beach Club, set in the same spot in a quiet cove near the iconic Catalina Casino. Half the beach here resembles a five-star resort where you can pay for a private cabana or chaise longue, with waiter service. The other half is more like a low-key beach party, with an open-air restaurant and bar, wide expanse of white sand, and kayak rental station. Descanso: $$; 1 Descanso Ave.; (310) 510-7408. Gone are the days when island dinners were limited to pizza and burritos. 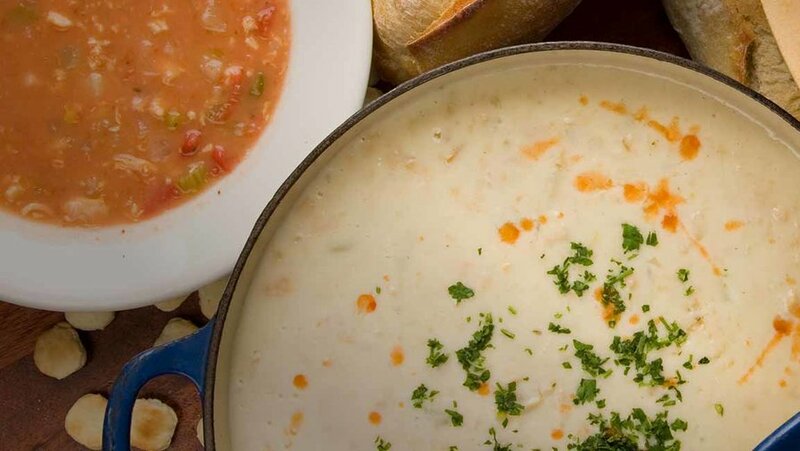 Try Bluewater Avalon, an offshoot of the popular Bluewater Grill, for its famous clam chowder and crabcakes, served in an airy dining room with an expansive waterfront deck. For something a bit more upscale, Avalon Grille trots out dishes like grilled salmon with lemon beurre blanc and New York strip steak with blistered heirloom tomatoes. Bluewater Avalon: $$; 306 Crescent Ave.; . Avalon Grille: $$$; 423 Crescent; . 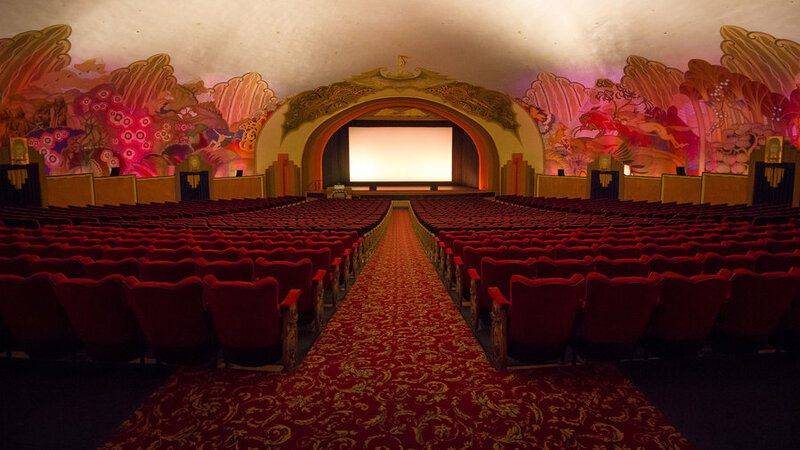 The island's biggest landmark, the historic Avalon Theatre in the Casino building is a 1929 art deco beauty, adorned from front to back with hand-painted murals. Best part? It shows a first-run movie every night. 1 Casino Way; (310) 510-0179. 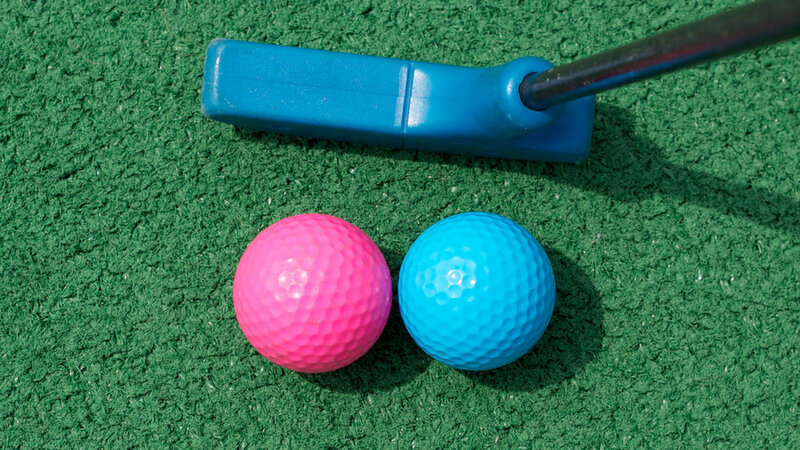 Two more words: mini golf! Golf Gardens has been entertaining putters for more than 40 years with its mazelike, multilevel holes and refreshing lack of gimmicks (read: no windmills). Golf: $9; 10 Island Plaza; (310) 510-1200. Best way to celebrate your hole in one? Saltwater taffy—made in-house from the same family recipe since 1934—at Lloyd's of Avalon. Lloyd's: 315 Crescent; .